Reflexology is a very adaptable and beneficial therapy and easy to apply once you learn some basic techniques! The good news is that is relatively easy for many of us to learn these new techniques and not only use them for ourselves but also use them for our children and loved ones. Sure, reflexology therapists have to undergo extensive training to learn the specifics of how to treat others professionally and in a mindful way. Mainly, this is to ensure that all therapists adhere to (and are held accountable to) the highest standards in their profession. The fact is, you can use the information in a non-professional capacity for yourself and your partner or children. I started out treating my little nephews as babies and they responded brilliantly to short sessions of reflexology on their feet. It is very soothing, encouraging good digestion, better sleep patterns and the therapeutic touch has a calming effect on the nervous system. These were exactly the results experienced by a recent client who brought her two very young children for a treatment. During the session, Mum also learned a few basic techniques which she continued to apply at home. I am delighted with the report she gave after one week, letting me know that all previous issues with sleep and digestion had cleared for her babies. This is a fantastic result! 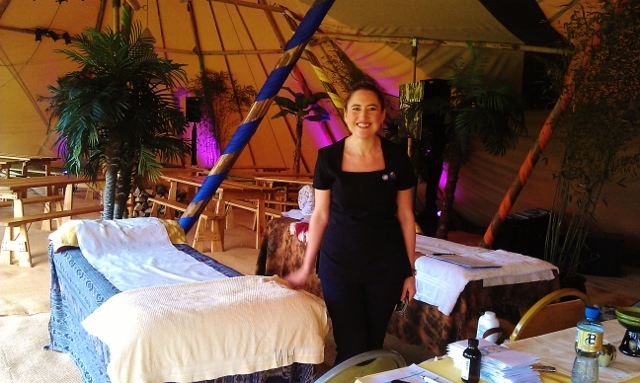 I have been demonstrating reflexology at national holistic events, on TV, in workshops and with my clients since the start of my holistic career, with the desire to support people in their quest for improved well-being and to encourage them to take charge of their own self-healing ability. 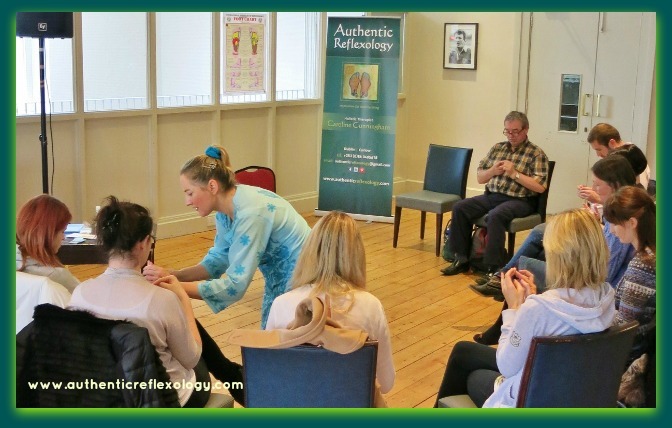 ‘Discover Your Magic Touch’ my follow up workshop to ‘The Power In Your Hands’ delivered at the Mind Body Spirit festival October 2015 sent a group of participants, including myself, back into a crowded venue floating on a fluffy cloud. 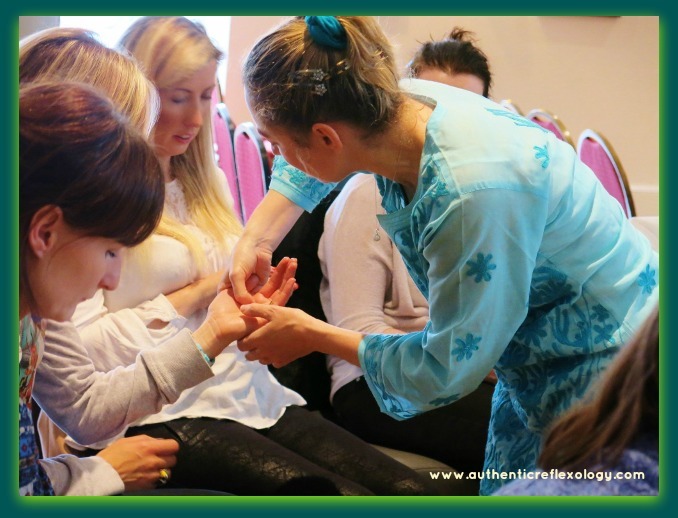 The purpose of this workshop which provides self-treatment well-being tips through hand reflexology is to explore the nature of touch in healing. There is much more to be noticed, sensed and experienced when it comes to healing touch. Bringing our minds into the present moment is so essential to being authentic and open to healing. The purpose of healing is to bring ourselves into an optimum state of being so as to allow us to achieve/be all that is within our power and capability. It takes a constant practice to keep stress at bay and to deal with the pressures and challenges we are likely to encounter in life. This practice stands to us. That is why I always encourage my reflexology clients to use the self-treatment tips of hand reflexology between treatments. 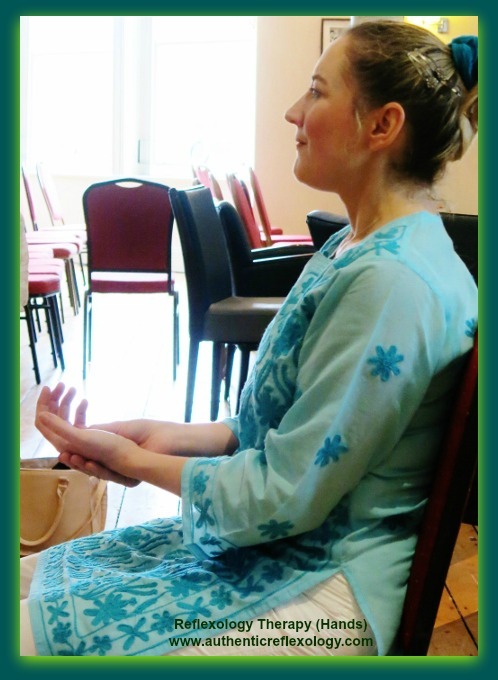 The workshops provide for a deeper practice of this self treatment. 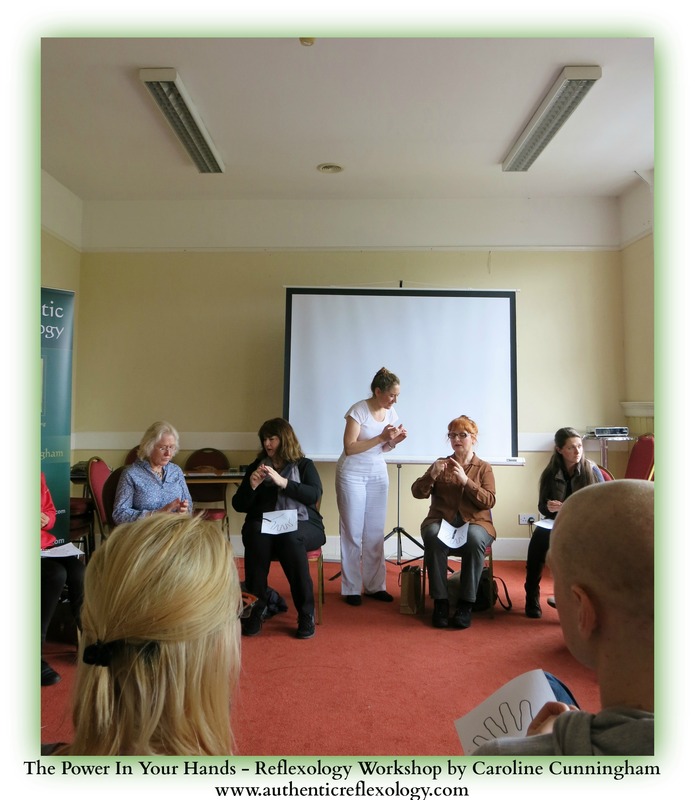 This particular workshop had a meditative feel to it from start to finish. I have found it is best to go with the flow of the group of individuals who present for this learning experience, just as it is important to tailor every reflexology treatment to the individual needs of clients. The three day event of Mind Body Spirit & Yoga festival was once again a great success. 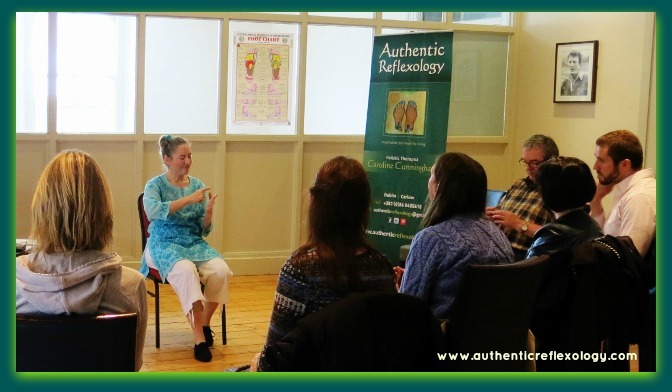 There was opportunity for interesting discussions on healing with fellow therapists and also with regards to the future direction of reflexology in Ireland. 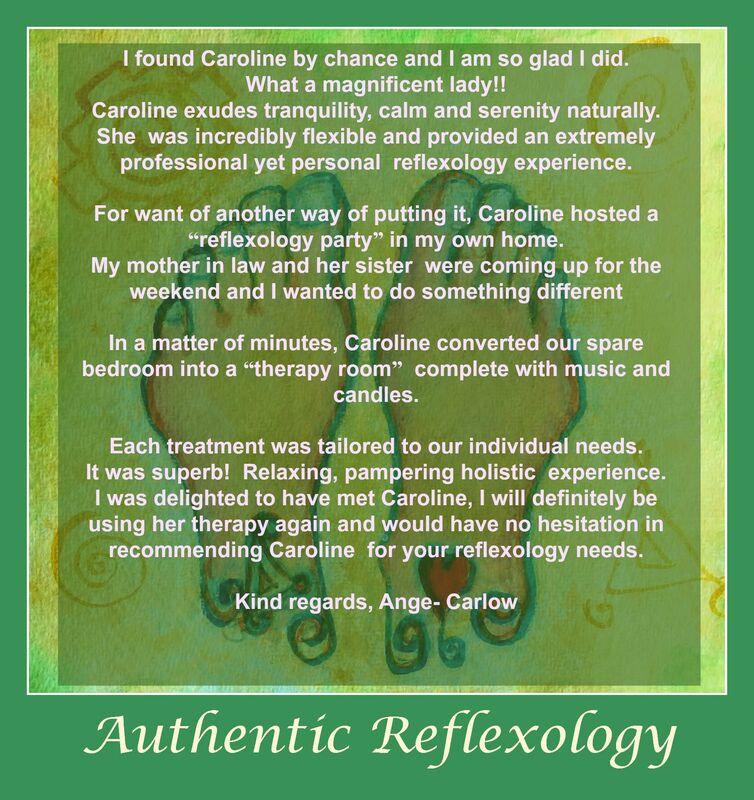 I had the opportunity to provide treatment to wonderful individuals and some allowed me to learn from their knowledge too as I had some reflexology therapists in their midst. I heard sounds of South America’s wooden flute, the roar of the Chinese dragon and resounding of great symbols and drums. I always enjoy walking Tony Christies Labyrinth. 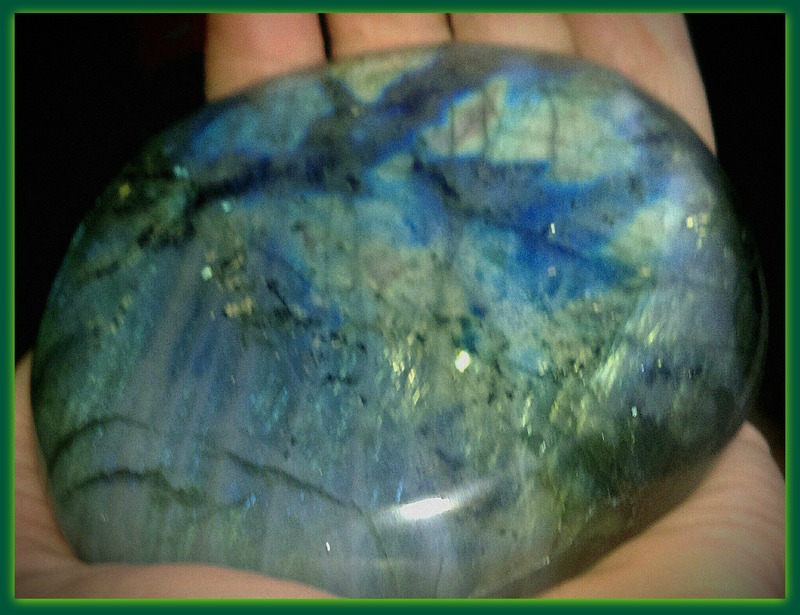 My house is filling up fast with the stunning crystals from Stone Age. It was a pleasure to once again exhibit alongside fellow therapists Olivier Florian, Yvonne Skelly and Trisha Lane. Mind Body Spirit Festival takes place in March and October at Dublins RDS. 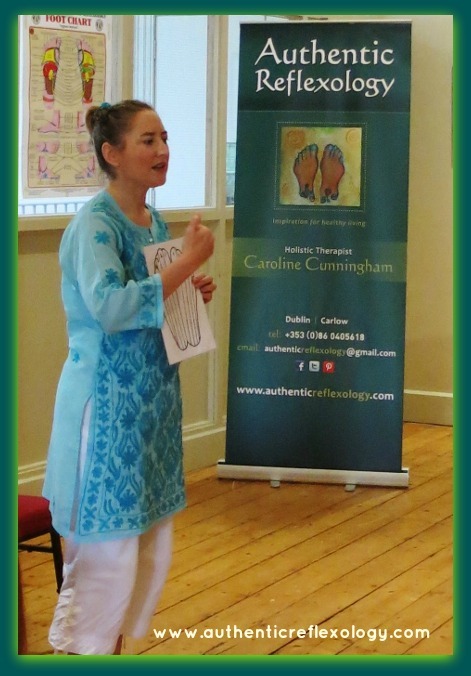 Providing reflexology self treatment workshops in your community centre or workplace. Treatments in the home or corporate venue can also be facilitated. Imagine a mechanical society with no thinking or feeling, everyone rushing about on automatic pilot, elbowing out of the way anything that appears on the horizon that doesn’t match in with this preferred mode of existence. Would you be happy with this? Do you think it is already happening on our streets? And what has Reflexology got to do with all of this? The following questions may help to determine if you are in danger of joining the Robotic Race. Q1. Is your life running completely on schedule, every minute accounted for, your targets maxed out to the last with someone reminding you that you could achieve a little more if you try harder (that someone could even be you). Q2. Do you only read articles that start with headings such as ‘5 Steps To This’ and ‘3 Ways To Do That’ because you don’t have time to read real life stories of personal interest which aim to impart wisdom in a more meaningful way? Q3. Do the important people in your life have the opportunity to connect with the flesh and blood version of your true self? Are you around long enough (and present) for that to happen? Q4. Does your food taste really good? Does it interest you at all? Can you smell the subtlety of flowers and does colour have any impact on your being? What about birds? Are they just for birds? Q5. Can you feel your toes? Are you becoming numb to what’s inside and outside of yourself? Do you expect to be repaired like a machine when part of you stops working, without your input or without any change from your current mode of being? Assuming you are not yet a robot, use your intuition to decide if you are on the edge of robot living. So how does Reflexology help to keep robot life at bay? Reflexology reminds us that every part of our body and mind is inter-connected. Our feet are a sensitive part of ourselves. Therapeutic touch and care goes a long way towards ensuring that we remain in touch with our human side. When we show our human side we enrich our own lives and the lives of those with whom we interact. Colour, smell, taste and sounds have so much to offer us in rich experience. Aim to enrich your life. Show your human side. And give reflexology a go if you haven’t tried it already, you deserve to be cared for, you are human. 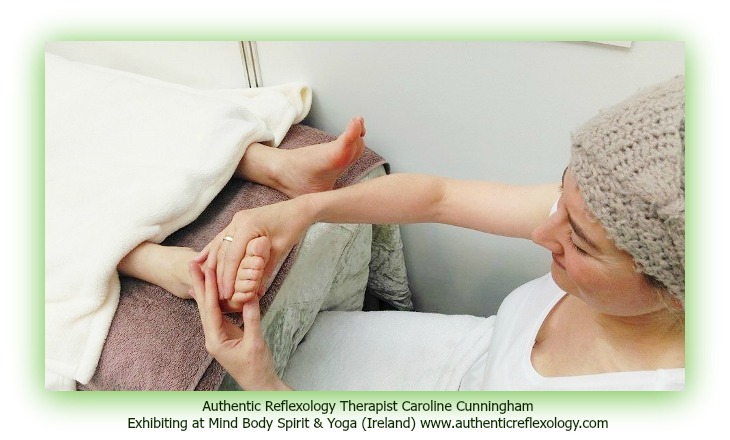 Authentic Reflexology is a regular exhibitor at Mind Body Spirit & Yoga in Dublin and provider of Reflexology Self-Treatment Workshops. What is Reflexotherapy of the feet and who is Hanne Marquardt? Thanks to my ITEC studies in the history of Reflexology, I already knew that Hanne Marquardt has played a key role in the development of this wonderful therapy. So I headed to Kilkenny (Ireland) to discover more about this fascinating lady and therapy. ‘I’m going to be eighty soon’, Hanne informed us at the outset of our two day course. Her eyes twinkled perhaps with wonder and curiosity as to what this new age bracket might herald. That curiosity has remained alive and well for Hanne, who as a young nurse and physiotherapist became most interested in the findings outlined by Eunice Ingham in her book ‘Stories The Feet Can Tell’. Eunice Ingham is attributed with developing the term ‘Reflexology’ and with the mapping of the whole body onto reflex areas of the feet, reflecting a micro-system of the whole person on the feet. Hanne wistfully reflected on the fact that she actually set out to disprove Eunice’s findings on the results of treatment by reflexology. In those early days the claims of reflexology were quite radical. As I attempted to probe Hanne with my own investigative questions I got a glimpse of how brave she must have been to challenge this pioneering woman. Hanne admitted humble defeat in her efforts and instead developed a growing respect for her teacher and the practice of reflexology. She has earnestly and whole-heartedly, continued its development and practice, fine-tuning the position of reflex areas and treatment techniques according to her own findings and thereby opening the door to her use of the term ‘Reflexotherapy’. Two days we spent with Hanne, eagerly listening as she imparted much wisdom and knowledge interspersed with humour and anecdotes for living simply and fruitfully. 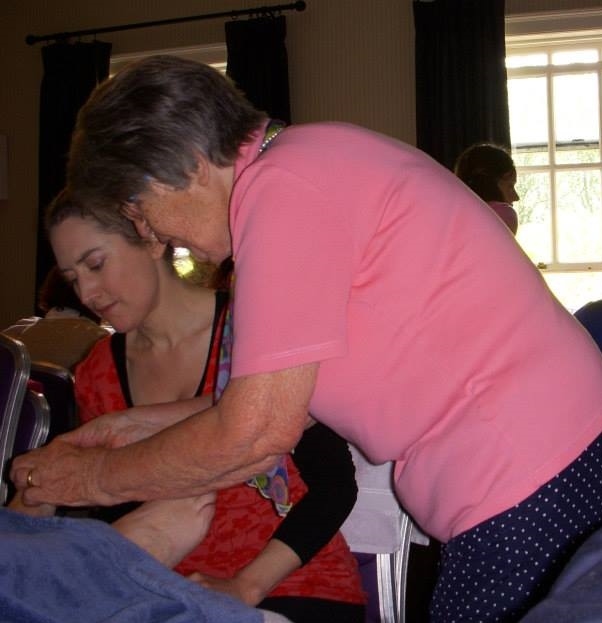 We watched intently as she demonstrated techniques for treating sensitive reflex areas and harmonising holds. We were put through our paces as she challenged us to locate the reflex areas corresponding to scars on the body of the person being treated. We practiced the treatment of such scars and all that she demonstrated to us under her watchful eye. Thanks to pioneers such as Eunice Ingham and Hanne Marquardt, Reflexology has grown to be a highly respected and recognised therapy. In Germany, however, Hanne has gained even further recognition for her use of Reflexotherapy as she treats ‘patients’ instead of ‘clients’ and for ‘specific illnesses’ rather than ‘generally’. ‘Always remember’ she paused for effect, ‘you are treating a person not a body or just their feet but a whole person.’ In order not to forget this fact Hanne urged us to use the term ‘someone’ as opposed to ‘somebody’. Studying with Hanne as our tutor was a pleasurable, productive and valuable learning experience. She clearly enjoyed the weekend also and is keen to return to Ireland soon to refresh our memories and provide opportunity for advancement of our skills. As we parted company she urged us to be creative in our practice and to be mindful of the unique potential that exists in all of us. 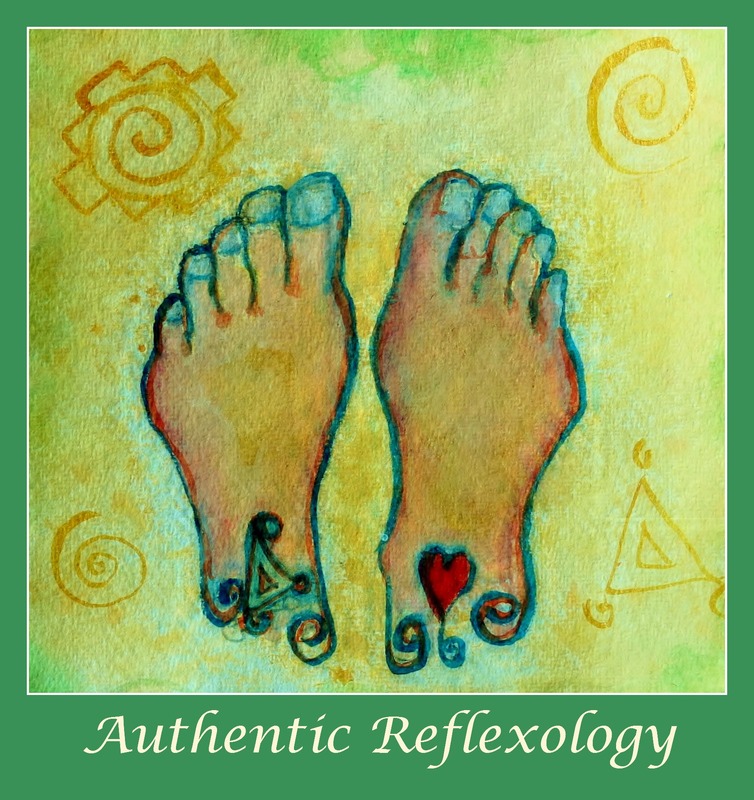 Copyright: Caroline Cunningham Author of Authentic Reflexology Blog.